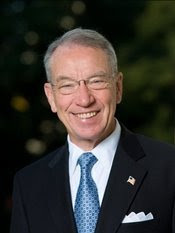 Senator Charles Grassley (IA) encouraged Iowans who work for major food manufacturers to make their voices heard in opposition to a national smear campaign against ethanol. As an example of making his own opinion known, Grassley sent the following letter to companies who are listed as members of the Grocery Manufacturers Association and have operations in Iowa. Recipients of Grassley’s letter include Archer Daniels Midland, Barilla America, Cargill, ConAgra Foods, Dean Foods Company, General Mills, Hormel Foods, Kraft Foods, Land O’Lakes, Pinnacle Foods Corp, Procter & Gamble, Ralston Foods and Sara Lee Corp.
For nearly thirty years, our nation has pursued policies to promote the development and use of domestic, renewable fuels. We've promoted renewable biofuels as a way to lesson our dependence on foreign oil and to improve air quality. During this time, the biofuels movement enjoyed overwhelming support. Now, an anti-ethanol smear campaign led by the Grocery Manufacturers Association is blaming U.S. biofuels policies for the rising cost of food and global food shortages. As a company with significant operations and employees in Iowa, surely you are well aware of the cooperative effort among all partners in the food supply chain to produce a safe, abundant food supply. Iowa's farmers and agricultural industries have long filled the breadbasket that feeds our nation and the world. This has always been a strong cooperative effort between family farmers, livestock growers, food processors, manufacturers and marketers. As a family farmer and a long-time partner in the production of our nation's food supply, I am personally disappointed and offended by the public relations smear campaign that the food processors and member companies of the Grocery Manufacturers Association are now spearheading. I hope you'll recognize that this smear campaign against biofuels is unfounded, irresponsible and pits traditional allies and partners in food production against one another. The propaganda being used by the Grocery Manufacturers Association and its high-paid lobbying firms in Washington, D.C., is patently false and should be disavowed. Administration officials with the Department of Energy, U.S. Department of Agriculture and the President's Chairman of the Council of Economic Advisers have all determined that the production of biofuels has had only a small impact on the rise in retail food prices domestically and globally. The facts prove that the rising cost of energy, worldwide economic growth, global weather problems, rising marketing costs, and the weak U.S. dollar all have a far greater impact on rising food prices than biofuels. All Iowans, my constituents and your employees, deserve an honest, fair discussion of the issues surrounding the rising cost of food. This smear campaign led by an organization of which you are listed as a member is harmful to an honest discussion and should be abandoned. I therefore strongly encourage you to call on the leadership of the Grocery Manufacturers Association to end this misleading campaign that is undermining and denigrating the patriotic achievements of American farmers to reduce our dependence on foreign oil while also providing a safe, abundant and reliable food supply. Thank you for your timely consideration of this request and I look forward to hearing from you soon.